The Jothisha Sastra (Astrololgy) states that if Raaghu is in good position in one?s horoscope He will bestow all prosperity (including Raja Yoga) to him and that person becomes a Kubera . In order to nullify Kalasthra dhosha, Naga dhosa and Putra dhosha one should worship Raaghu. People afflicted with Nagadhosa should perform oblations. Five kala poojas (5 times worship) are being done everyday. Special Abhisekas are performed between 4.30 to 6 p.m. (Raaghu Kala) in all Sundays. 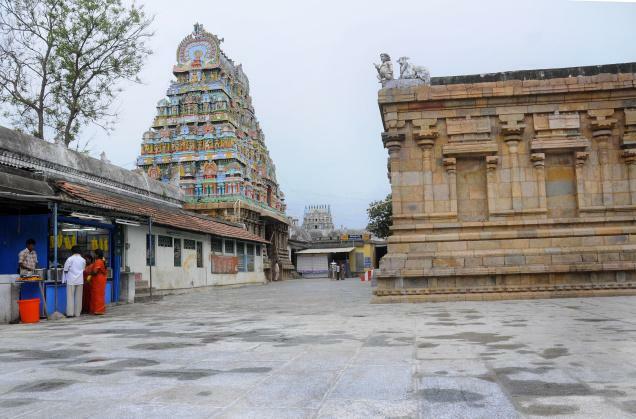 The Shiva shrine is dedicated to Sri Naganathaswamy. His consort is Giri Gujambika, is enshrined with Lakshmi and Saraswati by Her side. Rahu, the presiding deity worshipped the Lord here on Sivarathri day to redeem himself from the curse of a rishi. Sundays are very auspicious and devotees perform milk abhishekam to Rahu, who is enshrined with His consorts. A noteworthy feature is that the milk turns blue. A dip in Soola Theertha is said to cure one of diseases and give prosperity. The temple of Sri Rahu is located in Thriunageshwaram, near Kumbakonam, in Tamil Nadu.